Twi-Haters Rejoice! Twilight is Dead! Totally lame fact about me: when I am not busy writing articles for you kickass people, I am working in retail. Sad but true (got to do something to get me through college). That said, I have had the displeasure of working every single Twilight DVD release… during opening. I have experienced the lines of crazed Twilight fans outside the building and the mad stampede of Twi-hards clearing out our stock of DVDs. It’s the same with every Twilight release – CHAOS! But not this year. 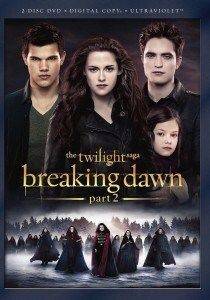 The Twilight Saga: Breaking Dawn Part 2 came out last week and I was at work bright and early. And well, there wasn’t a line, there wasn’t even a single person waiting outside for the doors to open. Nothing. A few people eventually came in a picked up a copy of the new DVD shortly after opening, but there wasn’t a rush of Twi-hards like past years. It was uneventful and it made it very clear that the Twilight craze is very dead. Twilight haters rejoice! *throws confetti* Twilight is over and done with. No more movies, no more books, no more anything. I’ll be honest, I am not a Twilight fan and I’m happy I don’t have to constantly hear about it anymore (or write about it). The fad is over and now we get to wait for a new craze to take over the world. One that doesn’t involve sparkly vampires and shirtless werewolves. All in all, I am happy that the Twilight madness has died down. I am still a bit surprised by the lack of crazy at last week’s release. I suppose people really don’t feel the same way as they did in the past. What are your thoughts on the Twilight craziness being over with?